They're giving away 3 of them at Comic-con this week, where they'll be showing off a pilot of their new show, Fringe. What's cool is that they prototyped these figures in house on the same 3D printer they designed the Cloverfield monster and the new Star Trek movie's phasers on. 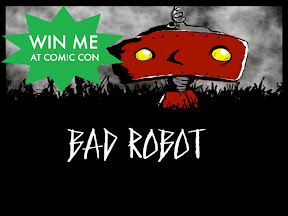 The Bad Robot webpage has been updated with the message "Win Me At Comic-Con". Maybe these will be scavenger hunt prizes? No word yet on pricing, or where they will be available. If anyone see this for sale at Comic-con, get one for me too! 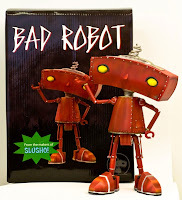 Paramount Pictures just alerted us that a Bad Robot Collectibles Raffle is going on at the Paramount booth at the San Diego Comic-Con. Only 500 were made, and they are raffling 3 away. I WANT ONE and I WANT IT NOW!!! I was thinking more along the lines of just 1 Giant bad Robot. That bad robot is really cool, JJ Abrams called my name during the Fringe Panel. I won 1 of the 3 robots that they were giving away. Even better is that JJ signed it. To top it off, when I was taking the figure to my hotel, I ran into JJ and got a quick pic with him. That was one hell of a Comic-con for me!